A SWOT analysis is an effective planning tool which offers four possible fields of strategic actions by combining the Strengths, Weaknesses, Opportunities, and Threats involved in a project or in a business. It involves identifying the objective of the business or project and recognizing the internal and external factors that are supportive or unfavourable to attain that objective. 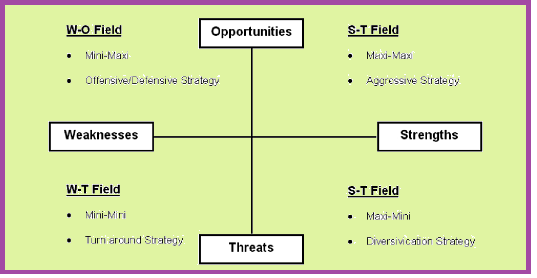 SWOT is often used as part of a strategic planning process. A SWOT analysis give directions to organizations to identify the positives and negatives aspects (S-W) and outside of it, in the external environment (O-T). SWOT analysis identifies the limited time period of corresponding competencies with opportunities. As a general policy, strengths and opportunities are maximized as well as weaknesses and threats should be minimized (Nadine Pahl, 2009). History of SWOT analysis: The SWOT analysis technique is developed by Albert Humphrey, who led a research project at Stanford University in the decade of 1960s and 1970s using data from many top companies. Main aim of this research was to recognize the grounds of corporate planning failure. The research results identified numerous major areas and the tool used to discover each of the critical areas was called SOFT analysis. Humphrey and the original research team used the categories "What is good in the present is Satisfactory, good in the future is an Opportunity; bad in the present is a Fault and bad in the future is a Threat." 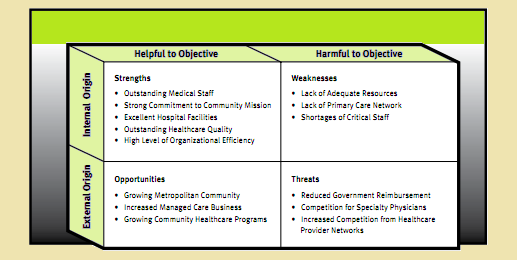 The SWOT method which is also known as TOWS, was initially developed for business and industry, but it is equally helpful in the work of community health and development, education, and even personal growth. In 2003, Panagiotou presented the SWOT analysis framework. He introduced a telescopic observations strategic framework which in effect maps strengths, weaknesses, opportunities and threats against his suggested acronym telescopic observations. SWOT is widely used as device for assessment of company. Compare it with other tools found in the Community Tool Box to determine if this is the right approach for situation. The strengths of this method are its straightforwardness and application to a variety of levels of operation. In management reviews, SWOT analysis is a mechanism for auditing an organization and its environment. It is a first stage of planning that helps to focus on key issues. 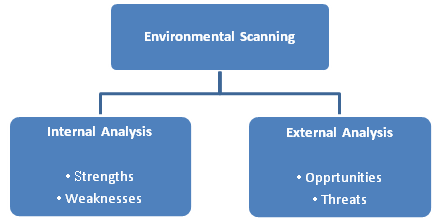 Role of SWOT is to take the information from the environmental scan and separate it into internal and external issues. Once this process is completed, SWOT determines if the information indicates something that will support the organization to attain its objectives or if it indicates an obstacle that must be triumph over or minimized to realize desired results. A SWOT analysis mainly concentrates on the four elements of the acronym, but the graphic format used by companies varies depending on the depth and complexity of their effort. The rationale of performing a SWOT is to reveal positive forces that work together and potential problems that need to be addressed or at least recognized. The analysis is usually described as a tool for the diagnosis of strengths and weaknesses, opportunities and threats of an organization. The description is often supplemented with an illustrative scheme of a relational SWOT matrix. Strengths: Strengths of SWOT analysis tool explain the positive attributes, tangible and intangible, internal to organization. They are within control of company. Company must evaluate its strengths by area, such as marketing, finance, manufacturing, and organizational structure. Strengths include the positive characteristics of the people involved in the business, including their knowledge, backgrounds, education, credentials, contacts, reputations, or the skills they bring. Strengths also include tangible assets such as available capital, equipment, credit, established customers, existing channels of distribution, copyrighted materials, patents, information and processing systems, and other valuable resources within the business. Strengths capture the positive aspects internal to business that enhance value or offer a competitive advantage. Weaknesses: This element of SWOT analysis is important for organization. It is highly significant to observe the weaknesses within business. Weaknesses are factors that are within company's control that detract from ability to obtain or maintain a competitive edge. This analysis points out the area of improvement. Weaknesses might include lack of expertise, limited resources, lack of access to skills or technology, inferior service offerings, or the poor location of your business. These are factors that are under control, but company must need to improve to effectively accomplish its marketing objectives. Weaknesses capture the negative aspects internal to business that detract from the value offer, or place company at a competitive disadvantage. The more accurately company will identify its weaknesses, the more valuable the SWOT will be for assessment. Opportunities: Opportunities in the SWOT analysis appraise the external attractive factors that represent the reason for business to exist and flourish. These are external to business. These opportunities reflect the potential of company that can be realized through implementing its marketing strategies. Opportunities may be the result of market growth, lifestyle changes, resolution of problems associated with current situations, positive market perceptions about business, or the ability to offer greater value that will create a demand for services. Opportunities are external to business. If company has successfully identified opportunities that are internal to the organization and within its control, then it will gain strengths. Threats: Threats consist of factors beyond control that could place marketing strategy, or the business itself, at risk. These are also external and company has no control over them, but company may benefit by having contingency plans to address them if they should occur. A threat is a challenge created by an unfavourable trend or development that may lead to deteriorating revenues or profits. Competition is always a threat. Other threats may include intolerable price increases by suppliers, governmental regulation, economic downturns, devastating media or press coverage, a shift in consumer behaviour that decrease sales. It may be valuable to categorize threats according to their seriousness and probability of occurrence. The implications: The internal strengths and weaknesses, compared to the external opportunities and threats, can suggest additional insight into the condition and potential of the business. The true value of the SWOT analysis is in bringing this information together, to consider the most promising opportunities, and the most critical issues. Aim of a SWOT Analysis: SWOT analysis shows the company's competitive advantages, Analyse prospects for sales, profitability and product development, Prepare Company for problems and allow for the development of contingency plans. Steps to perform SWOT analysis: The chief aim of strategic planning is to bring balance with the external environment and to maintain that balance over time (Sackett, Jones, and Erdley , 2005). Organizations achieve this balance by evaluating new programs and services with the goal of maximizing organizational performance. SWOT analysis is an primarily decision-making tool that sets the stage for this work. Step 1 of SWOT analysis: In this stage, company must involve in the collection and evaluation of authentic data. Depending on the organization, these data might include population demographics, status, sources of funding, and/or the current status of technology. Once the data have been collected and analysed, the organization's capabilities in these areas are assessed. In Step 2 of SWOT analysis: Data on the organization are collected and sorted into four categories: strengths, weaknesses, opportunities, and threats. Strengths and weaknesses generally stem from factors within the organization, while opportunities and threats usually come from external factors. Organizational surveys are an effective way of gathering this information, such as data on an organization's finances, operations, and processes (Carpenter 2006). Step 3: In this step, there is the development of a SWOT matrix for each business alternative under consideration. Step 4 involves incorporating the SWOT analysis into the decision-making process to establish which business alternative best meets the organization's overall strategic plan. Applications of SWOT analysis: SWOT analysis is practical for the business organizations as well as it can also be used in any decision-making situation by non-profit organizations, governmental organizations, and even individuals. SWOT analysis may be used to avoid crisis situations and also to resolve the crises. It can be used for planning, problem-solving, product evaluation, competitor analysis, self-development, and decision-making. It may also be used in feasibility studies/surveys conducted by business houses to appraise the potential impact or the chances of accomplishment of their proposed business plan before they actually implement it. Proactive thinking is enabled rather than counting on subjective opinions. It sets the framework for reviewing the strategy, the position and the direction of company. It is also valuable for versatile application such as business planning, strategic planning, strategic marketing planning, competitors' analysis, business and product development and research reports (Nadine Pahl, 2009). 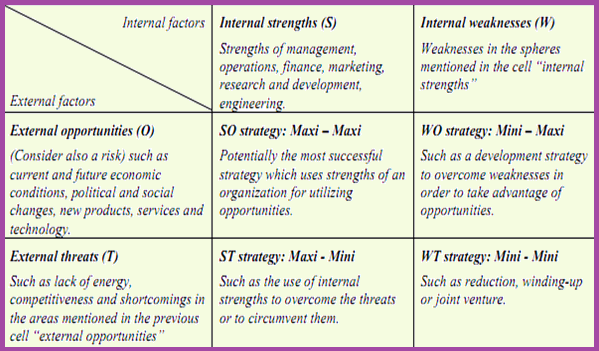 SWOT analysis facilitates an organisation to recognize its strengths and weaknesses. It supports strategic thinking. It enables one to focus on strengths, to recognize opportunities and to use them to his advantage. It enables one to predict the possible threats and to take measures to prevent or diminish their impact. SWOT analysis a brief overview of essential and relevant information about internal asset as well as market audit. Through using SWOT analysis, organization can exploit strategic window to increase profit potentials. Additionally, company is enabled to avoid or diminish unfavourable constellation of weaknesses or threats. It is a straightforward model that has no firm structure (Nadine Pahl, 2009). It can be modified to suit the particular circumstance in which it is to be used. Thus, its flexible framework is an important factor that has contributed to its popularity and its triumph. SWOT analysis can be implemented in numerous theoretical models like balanced score card, the Boston consulting group portfolio, or other performance evaluating and strategic definition tools (Nadine Pahl, 2009). It can be established that SWOT analysis is Scaleable, Simple, Low Cost, Flexibile, Collaborative, Quick, and Integrateable. SWOT Analysis gives valuable information that helps in synchronizing the firm's resources and capabilities with the competitive environment in which the firm operates. Though SWOT analysis has many benefits in strategic marketing planning and decision-making, it has some drawbacks also. It relies on subjective instincts, avoids quantification, and lacks prognostic powers (Agarwal, Grassl, and Pahl, 2012), therefore sometimes harms performance. One major difficulty with the SWOT analysis is that while it underlines the importance of the four elements related with the organizational and environmental analysis, it does not deal with issue of how the company can recognize the elements for their own company. Many organizational officials may not be able to establish what these elements are, and the SWOT framework provides no guidance. SWOT analysis is single procedure of categorization and has its own disadvantages. A person may unintentionally use wrong assumptions or may generalize the data used for SWOT analysis and this may have a negative effect on the decision-making process. It is very time-consuming when performed to deal with multifaceted situations involving huge amount of data. It does not have a detailed structure so the user may overlook on certain significant information which can affect the final analysis and its consistency can be rendered doubtful. It should be short and simple. The user should refrain from including too much or too little information. The user should not over analyse the data as it may lead to distortion of information. It must lead to the generation of valuable strategies which when implemented should result in the accomplishment of the objective. To summarize, SWOT analysis is beneficial tool for decision making and understanding dependencies between company and its environment. A SWOT Analysis looks at the strengths, weaknesses, opportunities and threats that are pertinent to an organization in a new endeavour. A SWOT Analysis is a device which allows users to consider the direction a company may desire to move towards in the future.